While products such as bananas, pineapples, kiwifruit and citrus have long been available to consumers in temperate zones, new fruits such as lychee, longan, carambola, and mangosteen are now also entering the market. Confirmation of the health benefits of tropical and subtropical fruit may also promote consumption further. Tropical and subtropical fruits are particularly vulnerable to postharvest losses, and are also transported long distances for sale. Therefore maximising their quality postharvest is essential and there have been many recent advances in this area. Many tropical fruits are processed further into purees, juices and other value-added products, so quality optimization of processed products is also important. The books cover current state-of-the-art and emerging post-harvest and processing technologies. Volume 1 contains chapters on particular production stages and issues, whereas Volumes 2, 3 and 4 contain chapters focused on particular fruit. Chapters in Volume 2 review the factors affecting the quality of different tropical and subtropical fruits from açai to citrus fruits. Important issues relevant to each product are discussed, including means of maintaining quality and minimizing losses postharvest, recommended storage and transport conditions and processing methods, among other topics. 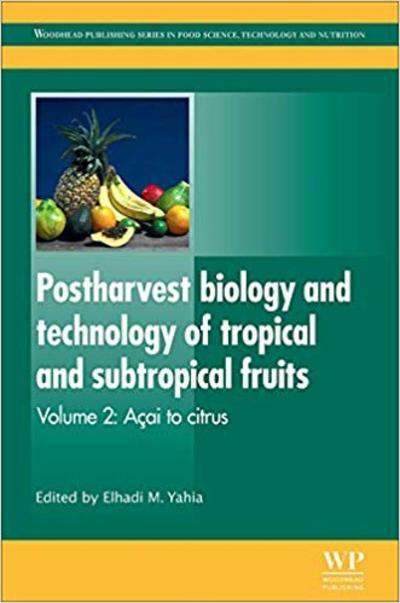 With its distinguished editor and international team of contributors, Volume 2 of Postharvest biology and technology of tropical and subtropical fruits, along with the other volumes in the collection, will be an essential reference both for professionals involved in the postharvest handling and processing of tropical and subtropical fruits and for academics and researchers working in the area.